With the assistance of my sous chef, the recipes keep coming to me and keep improving. 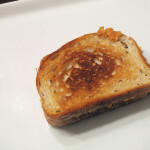 Each week I seem to write that this week was the best grilled cheese yet but it is the truth. As I continue to break out beyond the stereotype that a grilled cheese is two slices of white bread and American cheese, I begin to find, utilize and taste new ingredients, such as homemade salsa. If I never return to any of these recipes, at least I am continuing to learn, which is never a bad thing. Surprisingly, this was the first time that I made salsa. I know, I know, I have a lot of learning to do but I am trying! Anyway…because it was my first attempt at homemade salsa, I started with a basic kind, allowing for variance in heat based on the amount of jalapeno peppers. My father prefers a more mild salsa while I prefer a little more kick to mine. Alfalfa sprouts are rarely used in general American cooking, as far as I can tell, but should definitely be incorporated much more. 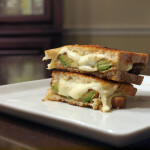 The sprouts added a nice crunch to the grilled cheese and was a great final ingredient. 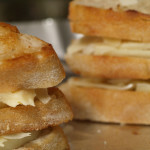 Our technique and ingredients have created a great grilled cheese at a nice crunch level with perfectly melted cheese in between. 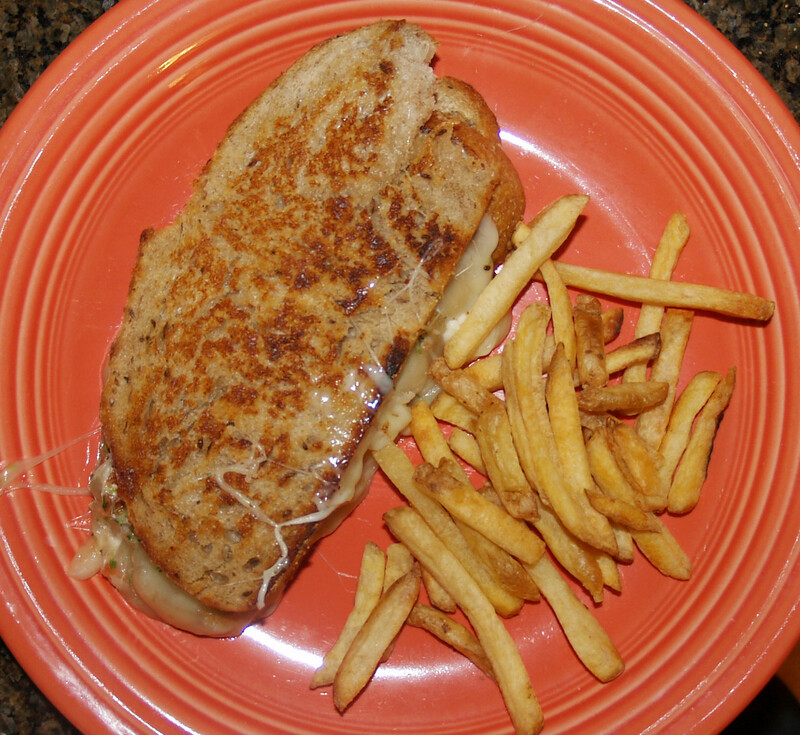 This grilled cheese was absolutely delicious. For those who like mild homemade salsa, you would love it even more than I did. However, as already stated, I like a little kick to my salsa and that is exactly what this was missing. I had to make the salsa mild for my father and then add in more jalapenos for my grilled cheese. When doing so, I over-estimated the power of the jalapeno and did not add enough. The kick stayed in the pepper, instead of the grilled cheese. 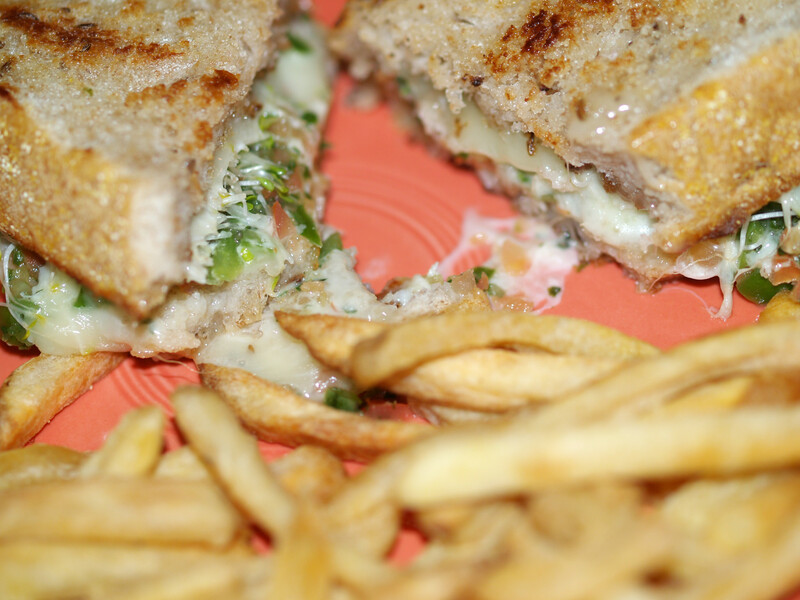 With that said, the crunch, the flavor, all of the tastes combined, made for an absolutely great sandwich. 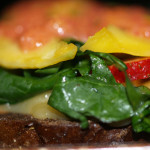 Putting salsa on a grilled cheese is a great idea and one that people should embrace more often. Oh and alfalfa sprouts, yes, they will return as well. Posted in Grilled Cheese and tagged A Minus, alfalfa sprouts, grilled, mozzarella, rye, salsa. I like the addition of tomatillo in the salsa, but could do without the sprouts! They taste like dirt to me!! AHHH!! !